We are the resource church for Widnes. We have a heart to reach out and make disciples - to invite people into following Jesus. The heart of a resource church is to be committed to worshiping Jesus, reaching out and building up. As God has given to us, we want to give back to our town. We believe in worshiping God with all we've got - mind, heart, body, soul, time, effort - you get the picture. We CELEBRATE JESUS. We want to ENCOURAGE the people around us, be helpful and kind. We want to LOVE our town both practically by providing aid through things like Foodbank and Street Pastors but also by praying for the people of Widnes and introducing them to Jesus our Saviour. So it has been about a year since we multiplied St Paul’s @ Spoons and we thought you might like to know how we’re getting on! Last year we decided to multiply Spoons to run on a Tuesday AND a Wednesday as the group had grown to the point where people struggled to hear each other across the table and there was no more room for growth. I have a terrible confession to make – I didn’t really like the idea of this multiplication. I didn’t particularly see the need for it (as I had been away for a couple of months at Uni) and didn’t understand how we’d continue to run with such small groups. A Wednesday night started with 4 of us but this very quickly went to 3 then back up to 4, we had one or two join us for a season but nobody seemed to stick. That was really difficult and sort of reinforced my belief that this was needless – “if it ain’t broke don’t fix it”. However, as the leaders of the Wednesday group, Jack and I decided to spend a day fasting and praying together for Wednesday Spoons, asking Jesus what he wanted us to do to grow that group and his answer was simple – Alpha. So we started an Alpha course in Spoons on a Wednesday night and for the first few weeks there was the usual four but no one else and then we had one new person join, and then another and another… As I write this it’s Thursday and there were 7 of us at Spoons last night (and that’s with one of our regulars missing). I could never have imagined that Spoons would be thriving over 2 nights in such a way but it is beautiful to see! It is even getting to the point now where we’re asking what’s next? What can we do to help spiritually nourish the people that are continuing to join us? How can we give room for more growth and more scope for all sorts of different people to join us? in general the young adults work at St Paul’s? Please pray for me as I listen to Jesus and try to take the initial obedient steps that he directs. The greatest position of strength for a Christian is on your knees. We need to pray, because the power that only comes through power is the power to change the world. Prayer is powerful. The Gospels speak of moments where Jesus leaves the crowds, goes to pray and takes only 3 of the disciples with him (Peter, James & John). One moment he does this is the transfiguration – he chooses to share this incredible moment where the voice of God reveals Jesus’ true identity (“This is my Son”) with only 3 of his friends. Another example is when Jesus goes to Gethsemane on the night he was betrayed. Again, Jesus takes Peter, James & John with him and asks them to pray for him as he prays – knowing the time had come for him to sacrifice himself. Jesus chose to share the most intimate, vulnerable, personal moments of his time on earth with just a few people. We know that prayer is a good idea – if it’s good enough for Jesus, it’s good enough for me! Jesus says “Ask and it will be given to you; seek and you will find; knock and the door will be opened to you. 8 For everyone who asks receives; the one who seeks finds; and to the one who knocks, the door will be opened.” (Matt. 7:7-8) If we want Jesus to make a way in this world for us, those we love or are concerned for we need to ask…and KEEP ON ASKING. When I moved away to college Jesus used this time to confront some things in my life. I used to be a bit irresponsible when it came to going on nights out with my friends – I would drink more to make myself feel comfortable. When I went to college Jesus showed me that the reason I did this was because I had quite a low opinion of myself so felt self-conscious and even sometimes worthless. This was a very difficult thing to confront and so I spoke to two of my closest friends in college. We committed to praying together once a week – we would praise God, pray for our community and finally pray for each other. Within this time we would ask God to give us messages and pictures for each other to crush the lies of the devil that we had believed in the past. It was an incredible time where we met with Jesus in a very personal way and got to encourage each other at the same time. So why wait? Who could you commit to praying with rather than just for? Let’s make a change to our world – it starts here. This week we’re thinking about the St Paul’s Way daily habit of doing Good Deeds. Sports minister bob was blessed by someone’s good deed not long ago so we thought we’d ask him to tell us all about it! “Last summer OneTwo sports ministries partnered with Wirral YFC and the 4, 6, 8 Project, Toxteth to run its first official Sports Holiday. The holiday was based in the Wirral at a location called ‘Barnstondale Activity Centre’. The aim of the holiday was to attract as many young people around the Merseyside area to a sports specific holiday where they would get the opportunity to meet with Jesus daily. Barnstondale itself is an amazing facility, it had everything we needed from an outdoor sports field, and indoor sports hall, a multi-use games area, climbing wall, archery range, an outdoor BBQ area and a stunning log cabin for some much needed rest. As you can imagine such a facility is pretty expensive. In fact it worked out at around £107 per child for 3 nights. This in itself didn’t seem too unreasonable for what Barnstondale could offer (as all the activities and food where included in the price). However, we felt the price per child may mean that majority of the children we (OneTwo sports, Wirral YFC and the 4,6, 8 project Toxteth) worked with would not be able afford the holiday. Amazingly we were given a grant of £1,500 towards the holiday, which meant we could charge £63 per child for the three nights – an amazing answer to prayer. 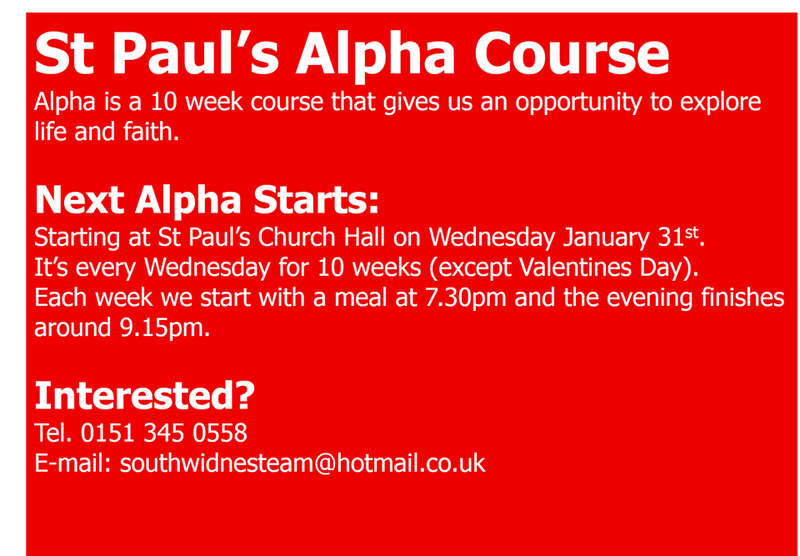 Hopefully most of you will know that we are starting the Alpha course on Wednesday nights 7.30-9.30 (beginning this Wednesday 18th for 10 weeks). The alpha course is for anyone who is wondering if there is more to life than this, what all this God stuff is about or what it means to be a Christian. It is a time where we can join together for a meal, think about life, the world around us and faith and chat to lots of different people. 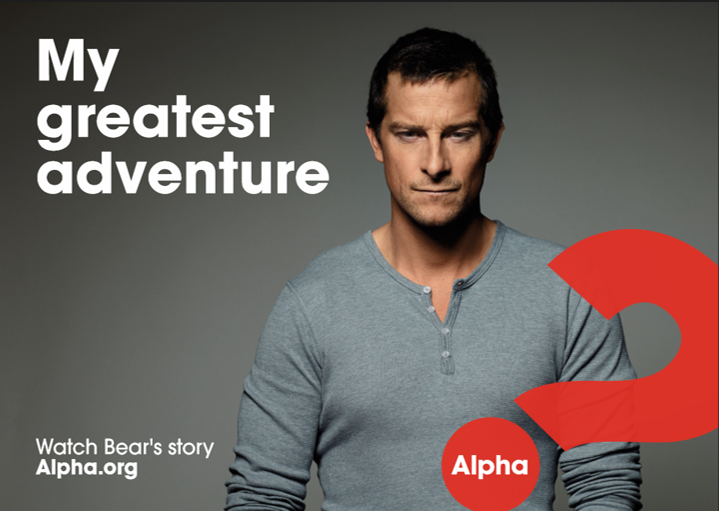 Alpha’s national campaign at the minute sees Bear Grylls speak of how putting his faith in Jesus has been his greatest adventure and it really is a wonderful adventure! Many of the people of St Paul’s came to believe and trust in Jesus through attending an alpha course and they all say it was a brilliant experience. In Long Loaf this week Billy shared about how alpha didn’t just give him a better understanding of who God is but also brought him lasting friendships with the people that he attended the course with – “the social part was just as important”. So, maybe Alpha sounds like what you’re looking for? Great! Sign up on the sheet at the back of church or let Greg or Kirsty know that you’re planning on coming. Maybe you’ve had a faith in Jesus for years, great! So who could you invite to come to Alpha? Who is the one person that Jesus is asking you to share your faith with? Invite them! Take as many flyers as you like from the back and invite as many people as possible. We want to see people join this amazing adventure: a life with Jesus Christ. Hopefully, by now you are aware of the fact that we are having a Christmas meal, here at St Paul’s on Christmas Day at 12pm! This is a free meal (although donations are welcome) which is open to…ANYONE AND EVERYONE! We want to encourage as many of you as possible to come down and get involved… Christmas is a wonderful time when we celebrate the birth of Jesus! We celebrate the willingness of God to come down to Earth in human form and be “God with us”. It has also become a great time to gather and celebrate with family and friends! Not have many family members around here and want to be able to enjoy Christmas dinner with good company? This is for you! Not able to afford (with either money or time) to purchase and cook a Christmas meal for yourselves and your family? This is for you! Plenty of family, able to afford it but would like to celebrate this incredible time with your wider church family? This is for you! In Matthew, Jesus said that those he judges to be blessed by His Father will be those who fed him when he was hungry and gave him a drink when he was thirsty and this is a great opportunity for us as a church to do just that! Of course, many of us have our own Christmas routine which is great and you can be involved even if you can’t come along on the day. Perhaps you would like to help financially towards the meal? Or assist Greg with some of the preparation on Christmas Eve? Or by simply spreading the word (especially to those in need this Christmas) that this is happening. For those who would like to come and eat with us on Christmas Day please tell Kirsty today or call Felicity in the office and put your name down. If you would like to help with either the preparation of the meal or support us in funding this event, please let Greg know. As you know, we are now in the season of Advent, a time of preparation and waiting for Jesus to come again as the King who reigns in glory. Alongside that we are in a time of preparation and waiting for the appointment of our new vicar. Due to both of these, we have entered into a time of fasting as a church. Some of us are fasting food, cake, alcohol or social media but the important thing isn’t necessarily about what we choose to give up but what we take up instead. Greg preached a couple of weeks ago about fasting and told us how it means “fastening onto” – fasting is a time for us to fasten onto Jesus. I’ve heard it said that it’s when we reach the end of ourselves that we hear what Jesus is trying to say to us the clearest. How incredible would it be if we could use our desires for cake, Facebook or wine to hear the energising wisdom and truth of our Lord? So the next time that craving calls, call to Jesus – pray for yourself, pray for St Paul’s, for Widnes, for our world. Praise God for all he provides and seek his will for your life and the life of our church (especially our new vicar). Essentially EWG is a monthly Sunday service at 6.30pm which is a little longer. EWG was originally started because those who had attended the New Wine conference in August desired a similar experience back here in Widnes. As such, there is a longer time of sung worship, an often interactive talk and then there is a longer time reserved at the end of the service to respond to what is said in prayer by asking God to speak to us. We often ask for the Holy Spirit to give us gifts of prophecy or healing in this time and we like to leave enough space to allow God to do what he wants to do. At the moment in EWG we are going through a series on the sayings of Jesus in John’s Gospel where Jesus tells us about who he is: “I am…” So far we have explored how Jesus is the bread of life and the light of the world and tonight we will be exploring how Jesus is the gate or the door. Everyone is welcome so please do come along… We believe that Jesus is alive and wants to do something here in Widnes and in our hearts and lives and we believe this is a pretty good place to start. The next habit in the St Paul’s Way for us to look at is one of our monthly habits: “Visit Someone”. This is as simple as it sounds – we as a church want to aim to visit someone from church once a month. Perhaps we are most likely to do this when someone is unwell – we want to hear Jesus say: “I was sick, and you visited Me;” (Matt 25:36). However, this is a great habit, not only in terms of visiting those who may be struggling to leave the house and so missing the company and fellowship of church, but also to develop the connections and relationships we have with each other across all of our balloons. This week we’re taking a look at one of the Monthly parts of our St Paul’s Way: Serve Here. I love the fact that God has made each of us unique with unique gifts. That means that only Linda can lead in the way she leads, only Gary can sing the way he sings, only Barbara can make a cup of tea the way she does, only Eileen can make butties the way she does, only Jeff can greet people the way he does… God wants us to use whatever we’ve got to serve - no matter how small it may seem! If Jesus can take 5 loves and 2 fish and feed over 5000 people – he can use “little old me” to serve his church. There is so much going on in the life of St Paul’s that you can get involved with not just within Sunday Services (welcoming people, making tea and coffee, helping make sandwiches) but also through the week at groups such as Long Loaf on a Wednesday afternoon who are always extremely grateful of an extra pair of hands to chop some carrots or wash a pan or two. So, why not get involved? This is one of our monthly ways but you can always serve more often if you like! Speak to Greg, myself or any of the balloon leaders for more information about how you can start serving here today! St Paul’s Tots is our new Parent and Toddler group running every Monday morning during term time from 10.00-11.30. It’s a warm, welcoming place where parents/ grandparents/ carers can bring their little one along, grab a cup of coffee and a piece of toast whilst their little ones can run ragged and play till their hearts content!!! It’s early days and we have only been running the group for 3 weeks, but it has been so encouraging seeing lots of new faces and seeing people bring along new friends each week. It is beautiful to see both parents and kids enjoying themselves! There are a variety of toys for babies and preschool children to enjoy, craft activities, a simple Bible story and we round it all off with singing some nursery rhymes and even doing the Hokey Cokey ( a family favourite!!!) So if you have a little one or know of anyone who has then please come and join us for just a £1 donation per family! Thank you to everyone who has been praying and asking about how the group is going. Please continue to pray that the group will be a place where people feel welcomed, are able to have fun and that the group will be a way for families to connect with the Church and most of all with Jesus.